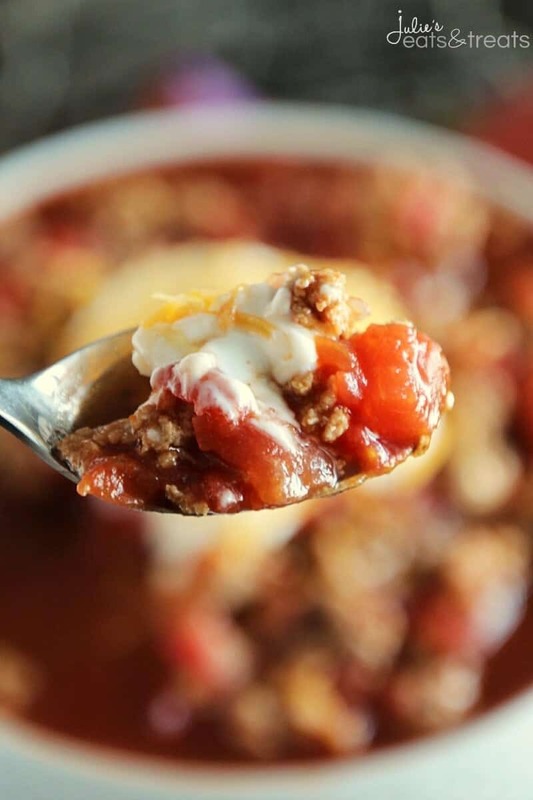 Light Crock Pot Spicy Turkey Chili ~ Delicious Light Chili Recipe with a Kick! 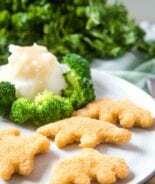 Only Six Ingredients to a Healthy Dinner Recipe! How’s that New Years resolution to eat healthier going? Good? Bad? Challenging? All of the above? I’ve been trying to focus on “healthier” recipes for my family this past year and I’ve been sneaking some of them in on the blog and I bet you haven’t even noticed! 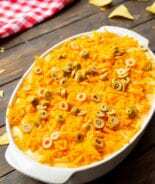 Some of our favorites are the Chicken Avocado Burger, Ham & Cheese Egg Muffins, Famous Crockpot Chili Recipe and Stuffed Lasagna Spaghetti Squash. You guys. The fact that my husband eats spaghetti squash and actually likes it still amazes me. He was a total meat and potato boy, but he’s totally broadened his horizons and I love it! Sure, I still make the occasional casserole and we indulge in treats, but I truly try to live the 80/20 rule. I’ll be honest. Weight is a constant struggle with me. I was overweight all the way through school and finally got it under control when I was a junior in high school. Every day since then I have had to make a conscious decision to make better choices or I’d be right back there. This involves portion control, making smarter eating decisions and working out 5 days a week. Currently, I’m obsessed with Daily Burn 365 which allows me to workout in my basement and every day there is a new workout plan! LOVE LOVE LOVE! I have a confession to make. I actually made this recipe for the first time last January and I held on to it until now. Ooops! I figured this was the perfect recipe to share while your New Years resolutions where still in the forefront of your mind. 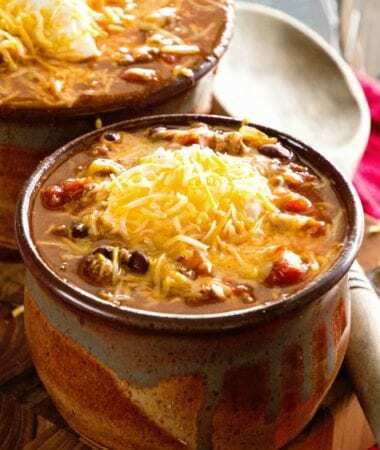 It takes a chili, a total comfort food, and lightens it up so you can still enjoy it and stay true to your resolution. Eating healthy does not have to be boring and taste like cardboard you guys! This chili tastes nothing like cardboard trust me. It has a kick with it so be prepared for that! If you like chili that’s a bit spicy you are going to love this. P.S. I added a tab of Healthy Recipes just for you! Now all my healthier recipes are listed there and you can just go there and pick out new recipes to try that fit your lifestyle! In a 6 quart Crock Pot combine all ingredients. Serve with Greek Yogurt/Sour Cream and shredded cheese. 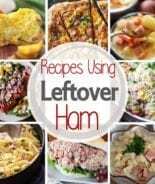 More Great Crock Pot Recipes! 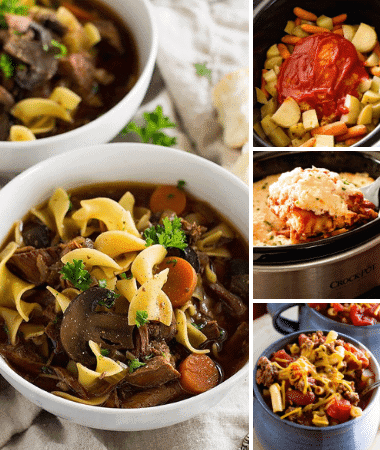 Follow my Best of Crock Pot Recipes Rounded Up! Board on Pinterest! 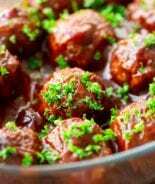 Follow Julie Evink | Julie’s Eats & Treats’s board Best of Crock Pot Recipes Rounded Up! on Pinterest. 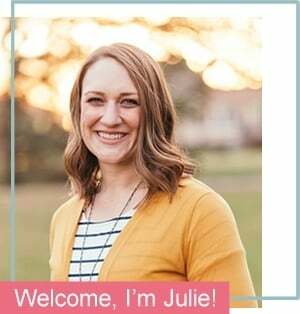 On Julie’s Eats & Treats! 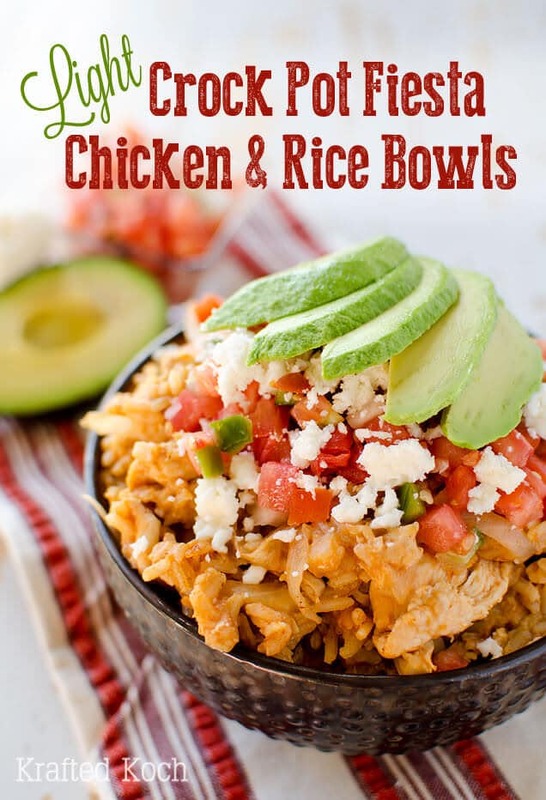 Light Crock Pot Fiesta Chicken & Rice Bowls ~ Loaded with chicken, brown rice and pico de gallo for a healthy dish you can throw in your slow cooker for an easy and delicious meal! 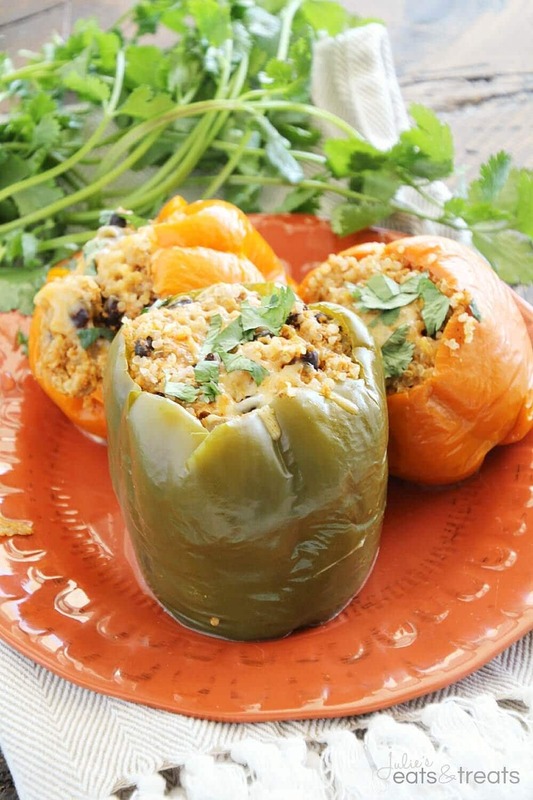 Light Crock Pot Quinoa Chicken Stuffed Peppers ~ Light & Delicious Peppers Stuffed with Quinoa, Black Beans, Onions, Chicken and Cheese then Slow Cooked to Perfection! 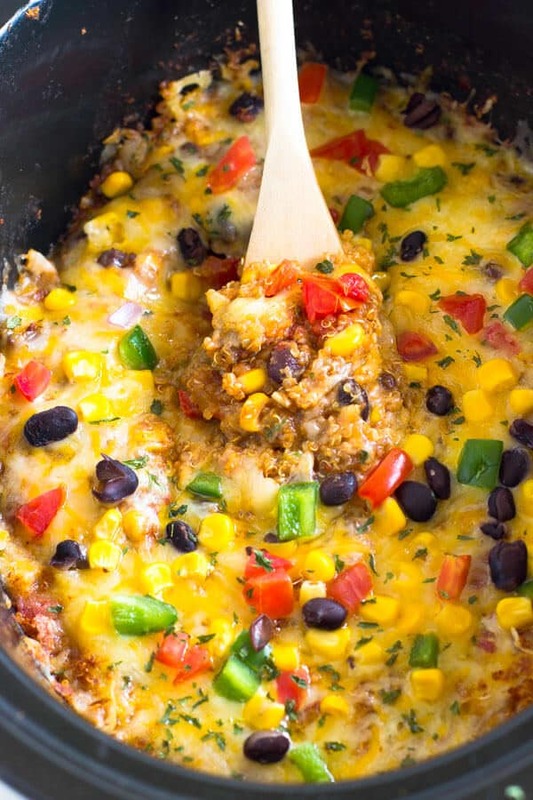 Slow Cooker Mexican Quinoa Bake ~ Only 10 minutes of prep work and is made with quinoa and all your favorite Mexican ingredients for a thick, filling and delicious slow cooker weeknight meal! 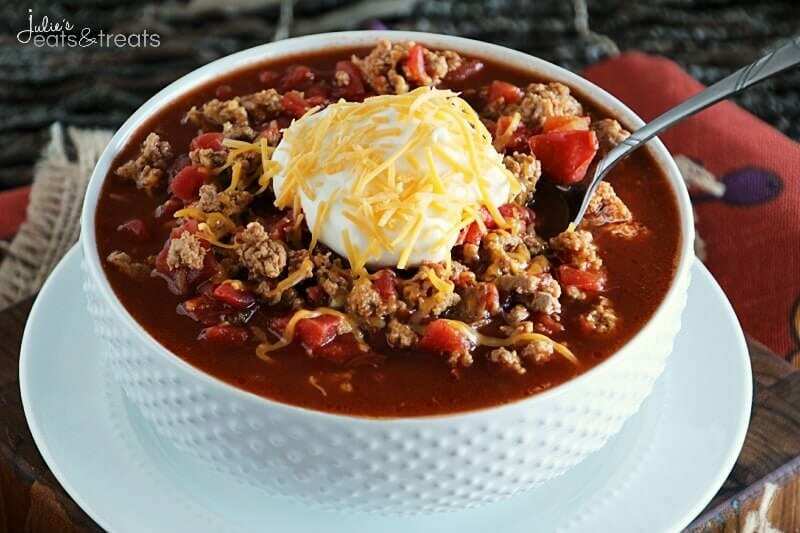 Wow, I love how easy this chili is! 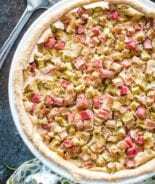 Perfect for a busy weeknight meal this winter! 🙂 Happy new year! This looks great! So comforting for the cold weather and love that you make it in the crockpot! So glad you are sharing this now 🙂 It looks so comforting and delicious! Love that it’s made in the slow cooker too! Can’t wait to try these recipes. I always look for easy way because I’m not a good cook. So I love the crockpot.